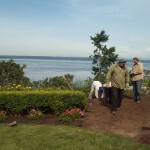 Luxor Landscape, Inc. specializes in landscape installation and maintenance. To accomplish exceptional results in every job, Arnie Gundersen put together a team that focuses on attention to detail, exceptional quality and personalized service. We listen intently to our customers and make every effort to exceed their expectations. From ‘mow-blow-go’ services to fully designed landscape installations, Luxor Landscape is the company to call. There is no landscaping project or seasonal service we haven’t done. Whether you know exactly what you want or are looking to develop your landscaping ideas, we’ll give you range of options, budgets and our honest, professional advice. Client Satisfaction is our top priority and it’s our goal to make our customers feel like they receive the very same quality of service we’d extend to our own home or garden landscaping jobs. There are some jobs or projects that give best results when done seasonally. Providing season-specific services to residential, HOA and businesses, Luxor Landscape, Inc. can help you with: snow removal, aeration, dethatching, pruning and mow & blow maintenance. Luxor Landscape, Inc. offers a 1 year industry-standard warranty for all plants installed with irrigation systems. We also stand behind all our licensed & bonded tradesmen and contractors. Since we treat our clients homes with the same care as our own, we only work with the best. Exterior environmental concerns are key factors in purchasing or maintaining a property. Protecting and mitigating wetlands is a significant part of our business. Working with homeowners and construction contractors alike, Luxor Landscape, Inc. are experts at identifying viable construction areas, maintaining special areas and performing mitigation to utilize the maximum amount of land. Thanks to the unique climate of the Pacific Northwest, we operate on a year-round availability for most projects. From sprinklers and excavation, fencing and patios, water features and low-voltage lighting to driveway pavers & paths – we can do it when you need it! DON’T SEE IT? JUST ASK US! Our extensive expertise covers a wide variety of services. Even if your project isn’t on this list, give us a call. We love a challenge! I have a Special Project!